Gregory Dolet, (B.P. - jeps pêche de loisirs), takes you fly fishing on the Gaves (mountain rivers) which have their source in the French and Spanish Pyrenees. Thanks to the the limestone, the water is rich and crystal clear during the low flow periods, making sight fishing possible for most of the season. Between April, May and June, the mountain snow melts. 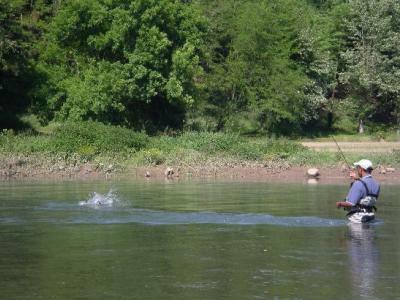 This can make the fishing either excellent or poor depending on the rivers and current water conditions. Local knowledge is obviously essential. Reservoir fishing for beautiful brownies and feisty rainbows provide an alternative for the rare periods when the conjunction of snow melt and heavy rain makes the rivers too high and muddy to flyfish.